Shotguns have been around for well over 200 years. Since the beginning of their long history, people have relied on them for hunting as well as personal and home defense. Nothing screams “get off my property” like a good ole’ shotgun! The shotgun design has advanced over the years but has relatively stuck to the same aesthetic look; that is to say, until Kel-Tec released their Kel-Tec KSG shotgun. The KSG shotgun has revolutionized what a shotgun can look and act like. In this KSG review we’ll look at a brief history of the modern shotgun as well as the specs of the KSG, along with its pros and cons. Kel-Tec was founded in 1991 in Cocoa, Florida. It started out as a CNC shop manufacturing parts for other firearm companies. That was until 1995, when they manufactured their first gun, the P-11 handgun. Since then, they have continued to innovate and progress in the firearms industry, finding themselves as one of the top gun manufacturers in the U.S and around the world. Any search of Kel-Tec on the internet will find a plethora of Kel-Tec haters, but the negativity seems to be focused on their handguns and other short-scale offerings. On the other hand, their long-scale models seem to be mesmerizing gun owners the world over, KSG being the top dog. Like I said in the opening paragraph, shotguns have been around for a long time. They are a part of pop culture at this point. 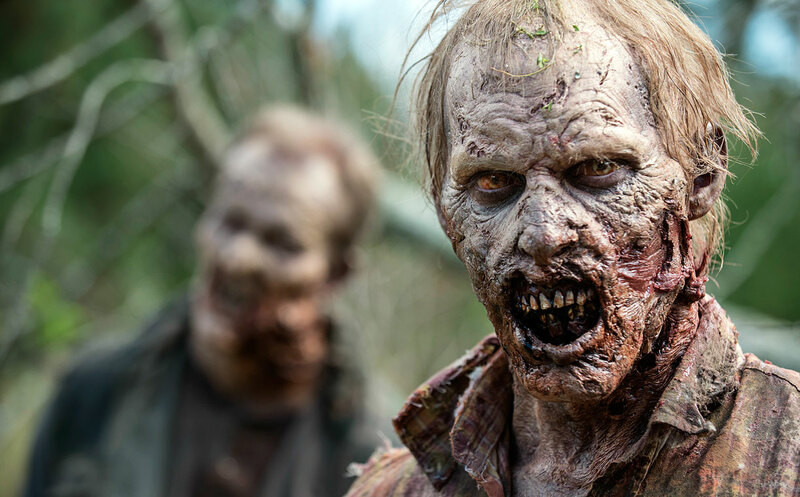 From Wild West movies to post-apocalyptic zombie movies, shotguns have blasted their way into public consciousness. We have John Moses Browning to thank for that. He single-handedly revolutionized the shotgun’s design and functionality. Back in 1887 while an employee of Winchester Firearms, he created the 1887 Lever Action Repeating Shotgun, also known as the Winchester Model 1887. Shooters at this point no longer needed to break open the shotgun and reload the gun. Now with a simple lever action they could introduce a fresh round into the chamber. A couple of years later, Browning introduced the 1893 pump-action shotgun, which allowed reloading with pump action rather than lever action. This is the model we are really interested in because it was the first to introduce ‘pump action’ into the world of shotguns. The KSG and other modern pump action shotguns are all descendants of Browning’s first pump action gun. Finally, Browning created the Browning Auto-5, the first semi-automatic shotgun ever made. The Browning Auto-5 was so popular that it was produced for most of the 20th century, up until 1995. Now with that brief history lesson, we can start talking about the gun we are all here for: the Kel-Tec KSG Pump Action Shotgun. The KSG is a pump action shotgun, but compared to the Browning’s look and feel, it’s as if they’re from different planets entirely. At first glance this shotgun reminds me of a gun you’d see in a Schwarzenegger sci-fi movie. The KSG is a dual barrel bullpup design which means the action is behind the trigger. Bullpup designs allow for a smaller gun (lower weight) while still maintaining a longer barrel (more accurate shot). The barrel length comes to 18.5’’ and the overall length comes out to an astounding 26.1’’ long. That’s 2’’ shorter than its nearest bullpup design competitor the UTS-15 and almost an entire foot shorter than the Remington 870 shotgun. Suffice to say that this baby is compact! The dual tube design allows the gun to hold up to 7+7+1 rounds depending on what cartridges you are using (one of the gun’s most popular selling points). That results in a whopping 15 rounds total. (Once again note that if you decide to use larger shells such as 3’’ rounds, you’re going to end up with one less round in each barrel). There is a manual selector switch which allows you to switch from one barrel to the other. 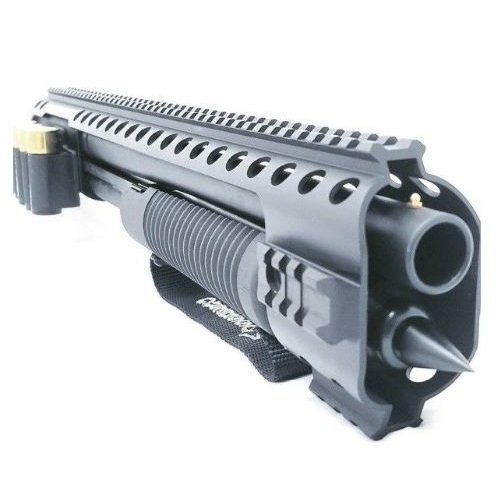 You can either load each barrel with a different kind of cartridge or use 15 rounds of the same type of cartridge, which makes the KSG very versatile. From what I’ve seen, the only disadvantage of putting two different shot types in each barrel is that in a moment of stress you may not switch to the shot you want. Different cartridges are effective at different ranges. For example, if you have bird shot in one barrel and slugs in the other and you have an immediate threat, you may mistakenly fire the less effective birdshot when what you really wanted was the slugs. 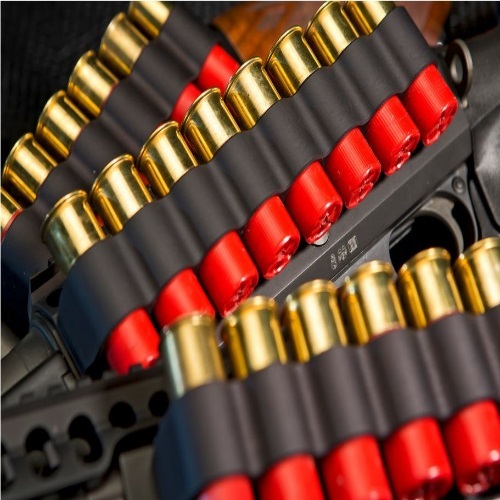 I’m not sure what you would need all those shells for, but as I like to say, “more ammo equals more fun!” Another advantage to the KSG is that it is bottom ejecting, so you’re not going to be hit in the face by burning shells. The KSG is not only super compact, it’s also incredibly light. This is due to Kel-Tec’s use of a light weight glass infused polymer called “Zytel”. The KSG’s receiver is made out of hardened steel while the stock assembly and grip are made out of the polymer. I mean this shotgun is 6.9lbs unloaded and only 8.5lbs loaded. That’s super light which can definitely be an advantage. Although not advertised on the Kel-Tec website, the KSG comes in a handful of color schemes, there is classic black, gold and titanium just to name a few. Disassembly is extremely easy. There are two pins located on the back of the gun. You slide out the pins and place them in two holder slots located on the grip that Kel-Tec has provided to ensure you don’t lose them. The gun then breaks down into 5 pieces for quick and easy cleaning. The KSG shotgun is completely ambidextrous meaning no matter what side you use to shoot from all the necessary controls are easily accessible. The shotgun has a cross-bolt safety with a bold letter “S” for when the safety is engaged and a bold “F” when the gun is engaged and ready for shooting. The KSG comes equipped with two MIL-STD-1913 Picatinny rails on the top of the barrel as well as along the pump. This allows the user the ability to customize the hell out of this gun. If you go on the Kel-Tec website they have a handful of accessories to offer, like a front angled grip and cheek rest. I looked up what other companies had to offer and found that Hi-Tech has bunch of really cool accessories as well. They sell a kit which includes a nut remover, extended selector switch and front muzzle break. The extended selector switch seems very cool because I have seen a lot of people complain about the stock barrel switch and how it is time consuming to toggle between tubes. The Kel-Tec KSG shotgun is an overall beast of a firearm. It’s lightweight and compact, allowing it to be concealable and easy to carry, in my opinion ideal for law enforcement and home defense. RELATED: Check out our Shotgun Chokes, Remington 1100, 870, Benelli Black Eagle, Nova, M2, M4, and Super Vinci features! Kel Tec have made various improvements to their initial KSG design. Gun enthusiast have begun to refer to the various versions of the shotgun as Gen-1 and Gen-2. Unlike Glock, Kel-Tec does not clearly classify their weapons with generations. This has lead to a lot of confusion for gun enthusiasts and KSG owners alike. The general way to identify which generation you may own or come across is via the serial number. Kel-Tec has produced over 50, 000 KSGs. It is still not an exact science but any gun with a serial number above around 20,000 is considered Gen-2. There are some people on forums claiming that there is a Gen-3 but that is still somewhat unclear. What is clear is the improvements the company has added. There are little slits on the barrel to allow the shooter to see how many shots they have left. They added a trigger reset and have improved their selector switch which tended to break on Gen-1’s. If the question is which is better the Gen-1 or Gen-2, the simple answer is Gen-2. The thing to consider here is price. The KSG Gen-2’s are a bit more expensive but include the upgrades. The funny thing about the KSG is that it depends who you ask. I’ve had friends who have nothing nice to say about this weapon. If you ask me I would totally recommend this shotgun. I have had nothing but a positive experience with the KSG. Both the KSG and Remington 1187 are quality shotguns that are popular with gun owners. The question is, if you could only own one which would you choose? The thing about comparing these guns is that they are different beasts. The obvious difference is appearance and overall design. The KSG is a bullpup while the Remington is a classic shotgun design. Both designs have their own unique advantages and disadvantages. Bullpups are not only cool looking they are function smoothly in tight close combat scenarios. This is because their overall length is shorter. 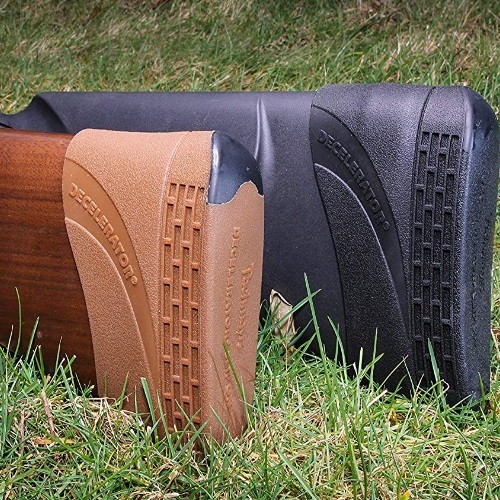 The KSG is 26.1″ long compared to The Remington 1187’s 48.5″. The KSG also can hold nearly 4-times the amount of ammo than the Remington 1187. It may seem like the answer is simple. Obviously the KSG is the better buy, but there are things you still may want to consider. The things to take into account with bullpups are balance and where your face sits and loading. Balance issues can occur l due to the fact that the weight is focuses on the rear of the gun. If you aren’t a veteran bullpup shooter there will be a bit of a adjustment period, but no big deal. Your face sits where the action happens so that may be something to consider. Lastly the KSG is famously a bit of a pain to reload. Folks, I’m going to say it, this is a classic case of personal preference. I would take the KSG over the Remington 1187 any day. I love bullpup designs and frankly find they offer everything I want in a shotgun. That being said the Remington 1187 is a well-built and powerful shotgun that is worthy of a try. Let’s start with the pros: once again, the gun can hold up to 15 rounds, which plenty of shells to neutralize any threat without having to reload. Furthermore, this shotgun is compact and lightweight, which makes it ideal for maneuvering small spaces such as hallways and tight corners. This is one reason why I feel it’s ideal for both police and home defense. Of course, if you seek something even more compact, a firearm with a barrel length of less than 16 inches or overall length of less than 26 inches, qualifies as a short-barreled rifle (SBR) – but SBRs can present more complicated legal concerns depending on your state. The KSG has its cons, most notably that once you have spent your ammo, reload time can be a real slow experience. The other main downside to the KSG is its price, which finds itself at right around $900. Other than that, the Kel-Tec KSG is a ‘killer’ shotgun that has flipped the gun world on its head! Choosing the right gun for you depends on a whole slew of factors. If shotguns aren’t up your alley, and you’re more in the market for a pistol, the New Glock 17 & 19 Gen 5 is the hottest thing on the market. Check out it and some of our other reviewed Glocks – like the 17 and 26 – here at Gunivore!